Sölden in the Austrian Tirol will unveil it's new on-mountain attraction, 007 ELEMENTS, in just under a fortnight's time on July 12th. Sölden was a location for the last James Bond movie Spectre where its glass walled Ice-Q restaurant was used to depict the exclusive Hoffler Clinic and parts of a major car/plane chase through the mountains were also filmed here. A more detailed impression of what the planned new dry ski slope complex at Sheffield may look like have been unveiled at a presentation to local business leaders by the city council and the development's private backers, Extreme Destinations. Snow depths are at the metre mark in New Zealand now after more snowfalls for the start of this week has helped to further build bases and bring powder conditions as winter 2018 continues to build up momentum. 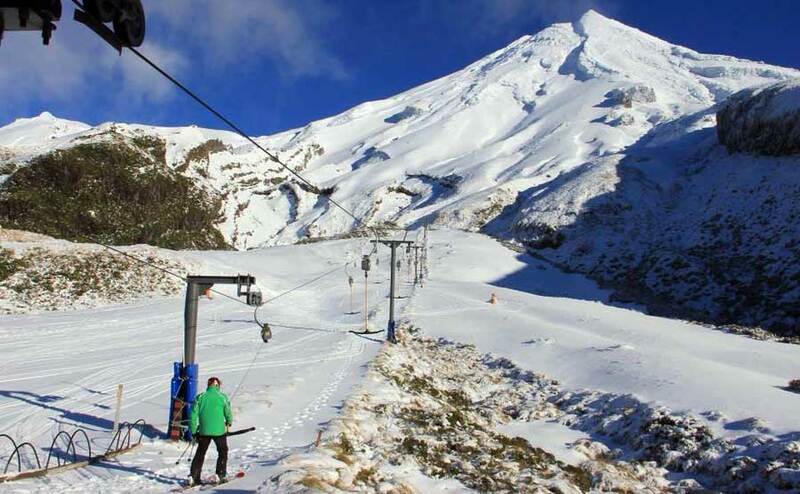 Ski areas in the South Island like Coronet Peak and Cardrona (pictured above yesterday 25 June 18) reported 20cm of snowfall by Monday and further 10-20cm falls on top with great powder skiing conditions during lulls in the storm. Big Summer Snowfall in the Alps! There's been some heavy snowfall reported on high altitude glacier slopes in Salzburgerland, Austria,for the start of summer. The Kitzsteinhorn glacier - one of just half-a-dozen currently open for snowsports in the Alps - posted the picture above this morning. It reports 20cm of fresh snow and a snow depth of 165cm. Read the full Article : Big Summer Snowfall in the Alps! The latest ski resort purchase by the Alterra Group in the USA means it and Vail Resorts now own 30 North American ski areas between them, including many of the big name destinations. Altrerra's announcement that it was buying Solitude ski area in Utah followed Vail Resorts revealing they had snapped up another four ski areas last month ? the purchases take their respective totals to 13 and 17 ski areas in North America (Vail Resorts also own an 18th area, Australia's biggest resort, Perisher). Australian ski areas are hailing what some are saying is the biggest early-season snow storm in the country for 18 years. Most of the country's leading areas have reported 80-90cm of snow fall over the past six days, completely transforming conditions soon after a largely snowless opening weekend a fortnight ago. The Australian ski season started last weekend but despite a big snowfall in mid-May, most of the snow cover had melted away and Australian media posted pictures of partially snow-covered slopes over-crowded with no place to make a turn and looking like a Costa Brava beach at the height of summer. France's three remaining summer ski areas will start to begin 2018 summer glacier ski operations from tomorrow. Val d'Isere will be the first to open its glacier ski area on Thursday 14th June, it will be joined by Les 2 Alpes and Tignes on the 23rd. The ski season has got underway in Australia with Perisher, the Vail-owned biggest in the country opening for the 2018 season earlier today. It is not really an auspicious start of the season so far as, despite a big snowfall in mid-May, the past few months are being reported as "the warmest autumn on record" in the country. Vail Resorts have announced they're buying another four US resorts to take their total to 16 in the US along with Whistler Blackcomb in Canada and Perisher in Australia. Val d'Isère in the French Alps reopened its winter lifts for summer skiing yesterday for the first time in its 82 year skiing history. The resort is one of three in France that do offer summer glacier skiing from later in June, but this year Val d'Isère have re-opened some of their (non-glacier) winter slopes for the first time ever because of all the snow that fell last winter, about 50% more than usual, which is still lying several metres deep on the ski runs. Arapahoe Basin in Colorado has rounded off a 234 day (almost eight months) 2017-18 season, closing yesterday. The resort, one of the world's 10 highest altitude ski centres, began its season back on October 13, 2017 last year. It was the first in the state and by some measures the first in North America to open and is the last in the state to close, although Mammoth in California is still open (to June 17th) so it's not the last in North America. There's been fresh snowfall in Lesotho and South Africa over the past few days - with the start of Southern Africa's 2018 ski season less than a week away. With 3 weeks to go until the Summer Solstice, here's our guide to where you can ski this month.